Panera, get the salt out, please! Panera used to be a go-to lunch place for me. 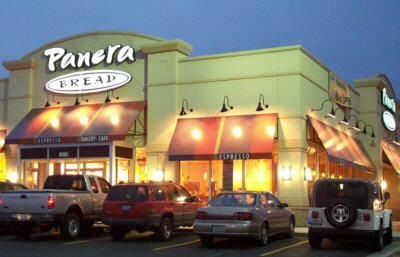 From 1998 through 2005, I worked out of a home office and lunch at a nearby Panera was a great break during the workday. But since my angioplasty, I have been working to eliminate salt from my diet and so Panera is a place I can no longer eat. Something as healthy sounding as its Mediterranean salmon salad, for example, has 990 mgs of salt, nearly two-thirds of my daily 1,200 target. And that’s without dressing, something else I no longer use. Miss you Panera, get the salt out of your menu please! Panera now has a New Year’s challenge going, asking people to drop five pounds in six weeks eating some new items it’s added to its menu. Problem is, when you click to the nutrition page as Panera’s website suggests, the new items are not listed. And unless I can see salt, fat and sugar content, I can’t try them. Bad move Panera, if you’re going to promote new products as healthy, boldly display nutrition information for them. No salt, no fat, no sugar restaurant menus? Not just yet.